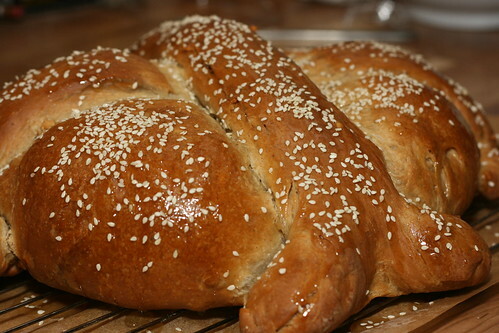 The next bread on my list from Bread Baker’s Apprentice was the Greek Celebration bread, or Artos. 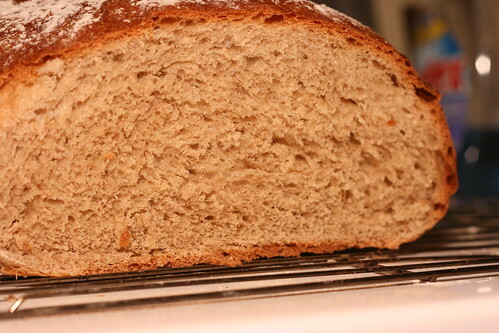 I actually made it twice, the first loaf as Christopsomos and the second as just a plain boule. The first loaf I cheated and made the poolish the same day, but it still had quite a few hours to generate some flavor. 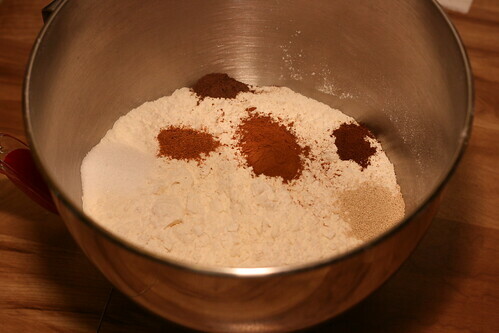 It started off well and I measured out the dry ingredients, I didn’t have either of the two special spices mentioned in the recipe so I just went with the standard, cinnamon, cloves, allspice, and nutmeg. 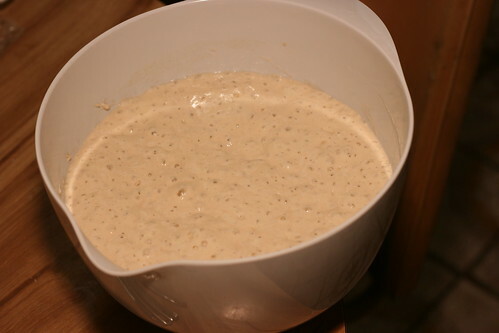 And the poolish was ready and waiting (although I didn’t use all of it, the rest of the poolish was for a batch of ciabatta). Then I measured out the dry ingredients, and although it isn’t obvious here I made a critical error… I completely forgot the eggs! Thankfully I remembered while the dough was mixing, and with some patience, was able to get them incorporated. 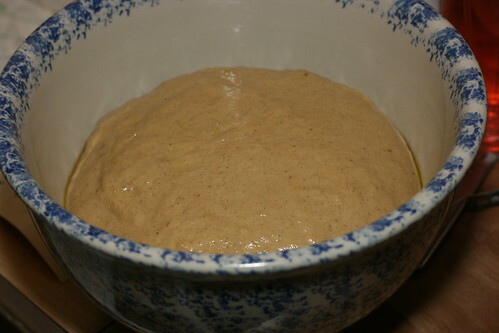 Then came the next mistake I forgot to add the walnuts and dried fruit in until I already had the dough shaped and had it in the bowl. Obviously not a good day! I added them in at that point although I had trouble getting them well distributed without threatening to tear the dough. 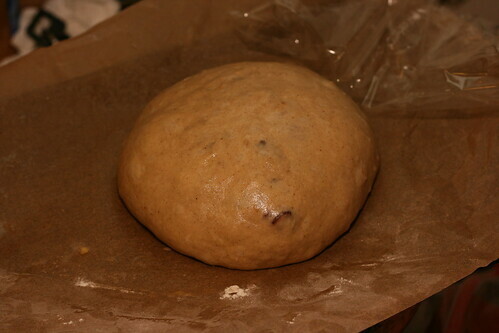 After a rise the dough was ready for shaping, I cut off about a third of the dough ball and put it in the fridge, shaped the larger piece as a boule and placed it on a prepared baking sheet. 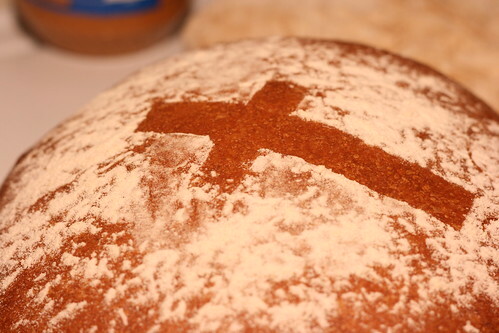 I had a lot of trouble shaping the two strands for the cross on top of the loaf, I got a little too much oil in the bag with the dough so it wouldn’t stick to itself very well, and too many nuts and dried fruits in the strand pieces. The nuts and dried fruit made it really difficult to roll them pieces out to the appropriate length and get them nicely and evenly shaped. 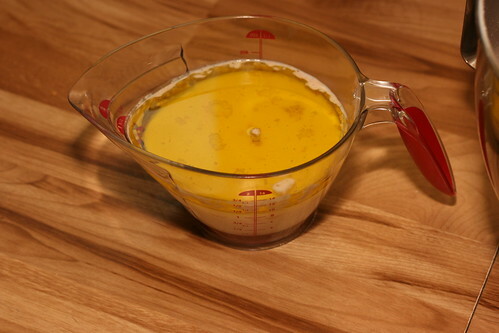 The extra oil on the dough also prevented the little curls at the ends of the strands of dough from holding. In hindsight I probably should’ve just added some flour to them. 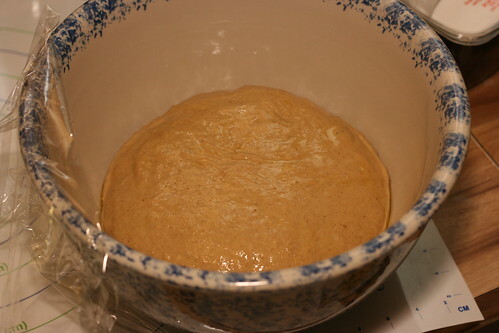 The second loaf made as just an artos was much less eventful, I managed to remember to put the eggs in, and there were no fruits or nuts to deal with, and it just needed to be shaped as a boule. I did however add another decorative touch to it to keep with the theme. Unfortunately I only remembered to take a picture of the second loaf, both loaves were really yummy though. The glaze and dried fruits seemed to keep the Christopsomos somewhat more moist, and the moistness also seemed to bring out the flavor of the spices a bit more, although it vanished after about three days.